The time is right to celebrate the architecture, and the people behind it in Palm Springs today. The Palm Springs Project took root as I was beginning a new relationship with the desert in 2010. With the purchase of a 1959 William Krisel designed home, curiosity began to get the best of me as I began exploring the desert architecture, landscape and it’s people. As a people photographer I began to question, “Who lives in that house? Who is the person that designed that house?” The camera has always acted as a passport into other worlds and a wonderful learning tool. Simply put, I wanted to meet the modernists that lived behind the decorative screen block. I went to work. The Palm Springs Project is a perfect union of photographing and discovery. Over the course of the four year project I photographed over fifty architecturally significant homes and the owners that have lovingly nurtured them back to life. I have had the privilege of making portraits of the handful of Midcentury Modern architects who are still with us, masters who used the empty California desert as a canvas to make dreams concrete and to expand horizons of what the art of architecture could be. My camera has also captured a few of today’s contemporary desert architects who stand on the shoulders of these pioneers, as well as the region’s blend of artists, preservationists, revivalists, members of the old guard, and the assorted cast of characters who make up the new Palm Springs renaissance. Along with the photographs in my book, you will find insightful statements from each of the subjects gathered from interviews conducted by writer and editor Matthew Link. 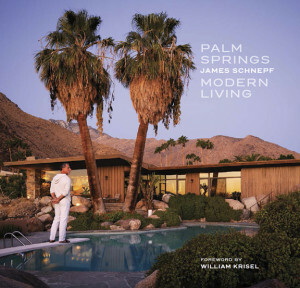 Architect William Krisel shares his insights into the people of Palm Springs and desert modernism in the book’s foreword. And finally, the book’s tasteful design has been created by Gary Wexler. This one-of-a-kind photographic collection is showcased in PALM SPRINGS MODERN LIVING, my coffee table book released by publisher Gibbs Smith in March 2015. I hope you will enjoy exploring this fascinating world and its people as much as I’ve enjoyed discovering it.